*This post has been sponsored KILZ®. All thoughts and opinions are my own. As a lover of all things mid-century, it’s probably not too surprising to hear that I also love wood paneling. I cringe whenever I watch TV designers ripping out original paneling in retro homes, because I think that wood grain adds so much richness and beauty to a space. Of course, there are exceptions and not all paneling is created equal, but I generally am on the side of “Team Paneling,” and could never imagine getting rid of our own real wood paneled walls downstairs. To help me celebrate this love for paneling, I teamed up with KILZ® to try my hand at getting the look of paneling without heavy duty power tools. Scroll on to find out how I gave one wall in our master bedroom a wood grain finish using nothing but paint, tape, and brushes—no, really! 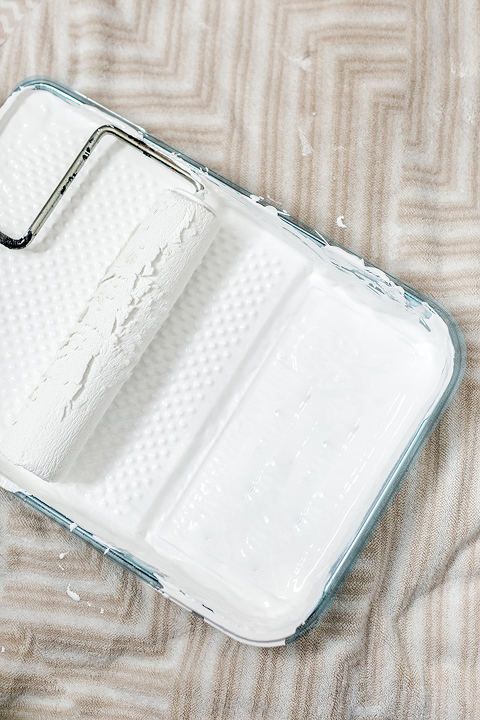 Start your painting project off on the right foot first thing by prepping your wall with primer. I’ve skipped this step before, and always (always) regret it because primer helps cover old paint colors, plus it gives your top coat a nice foundation to “stand on.” Point is, learn from my past mistake and get yourself a bucket of KILZ 2® Latex Primer. If, like us, you only plan to paint faux paneling on one wall, you won’t need much primer, but I would still suggest springing for the full gallon. You can order it online from Walmart like I did so it comes right to your door, no hassle, and I wouldn’t be surprised if you end up using the entire gallon on projects around your house throughout the year ahead—I know I will. They also carry the paint in store if you prefer to see materials in person. Click here to find your closest Walmart. Before painting, though, make sure to use painter’s tape to mask off all four edges around your chosen wall. Press the tape down firmly with your fingertips or a plastic straightedge, and then you’re ready to paint. If you need more than one coat of primer to cover the old wall color, make sure you wait until the primer is dry between coats before painting on another layer. When the primer is finished and completely dry, it’s time to move on to what I’m calling the under color. This is referring to the dark color that shows in between your faux wood panels—think of it sort of like the “grout.” I already had a can of KILZ Complete Coat® in “Rebel” leftover from this DIY project, so I went ahead and used that (but, like the primer, you can also grab this online from Walmart!). 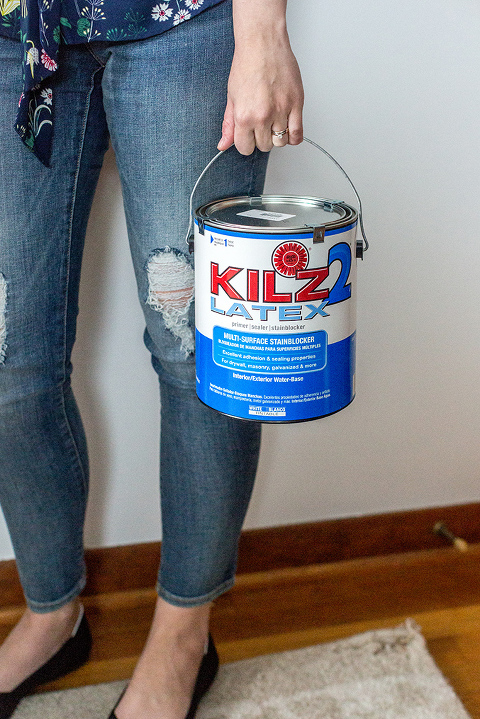 The cool thing about KILZ Complete Coat® paint is that it’s built for both indoor and outdoor use, so if I manage to come up with a third idea for this leftover paint, I know just what to grab from our paint shelves in the basement. The almost-black paint went on like a dream, and, since I just needed the color to show in small doses between my faux wood panels, I only needed one coat of paint. It’s okay if your under color isn’t completely uniform. In fact, a little variation helps it look more realistic in the end. Climb a ladder or step stool and, without cutting or tearing it, unroll a long section of 1/2-inch painter’s tape. Press the end alongside the pencil mark at the ceiling. Get down off your ladder, unrolling the tape longer as you go. Press the other end of the long tape strip beside the pencil mark you made at floor level. Tear the tape off the roll. Use your fingers or a plastic straightedge to press the tape firmly to the wall, all the way from floor to ceiling. Repeat until you’ve covered the wall with even tape lines. Time for your faux panels! To get the look of rich wood grain, I used a combination of KILZ Complete Coat® paint in “Yule Log” and “Ancient Spice.” First, I cut in around the edges of the wall using the lighter color (“Yule Log”) and then covered the rest of the wall in the same color using a roller. Just one coat did the job to give me a relatively uniform—but still natural—wood look. KILZ® suggests waiting 2 hours to dry and 4 hours to recoat. Now for “Ancient Spice,” which is just slightly darker than “Yule Log.” First, I dipped a cheap bristle brush into the can of mixed “Ancient Spice” paint, and then I slashed the paint right over top of the “Yule Log” panels in a thin vertical motion. The more random and erratic your brush strokes, the better since your goal is to make the paint look like a wood grain, which has a lot of natural variation. You can see in the mid-motion photo I snapped below that I slashed the paint right over the masking tape, and that I left a good bit of the lighter paint color showing through. I know it might seem like a tall order, but do your best not to overthink it. Throw on a podcast or some good music, and then just let your arm do all the work. The really good news for those of you who might be feeling a little intimidated about trying this yourselves is that these two paint colors are very forgiving together. Once they dry, there’s only slight variation, so any areas that you might have under- or over-worked will be hard to notice. I included a GIF animation below to demonstrate what steps 3-6 look like in case you’re more of a visual learner. 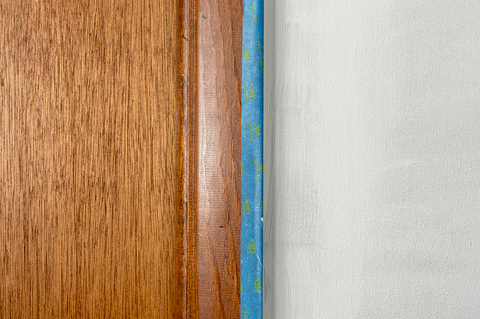 Before your paint dries, go ahead and remove all of the masking tape—both the panel lines and the tape you used to mask off the edges of the wall itself. You’ll want to pull the tape back over itself slowly at a 45-degree angle while the paint is still a little wet, that way you don’t end up accidentally peeling away dry paint with the tape. Discard the tape, let the paint dry completely for a few hours, and then you’re done. I honestly was so surprised by how well this project turned out. Sure, I tend to have pretty high hopes for any DIY project I try at home, but my vision for this one seemed a little loftier than normal. Every single person I explained the project to gave me a look like, “I’ll believe it when I see it,” and I even started second-guessing myself a little bit before finally cracking open a can of paint. Turns out those fears were unfounded across the board, though, because our faux paneled wall looks pretty darn believable (if I do say so myself). I remember texting mid-progress photos to my husband saying, “This might actually work!” and you can imagine the giant smile that materialized on my face when he responded with an almost-immediate, “Wow! 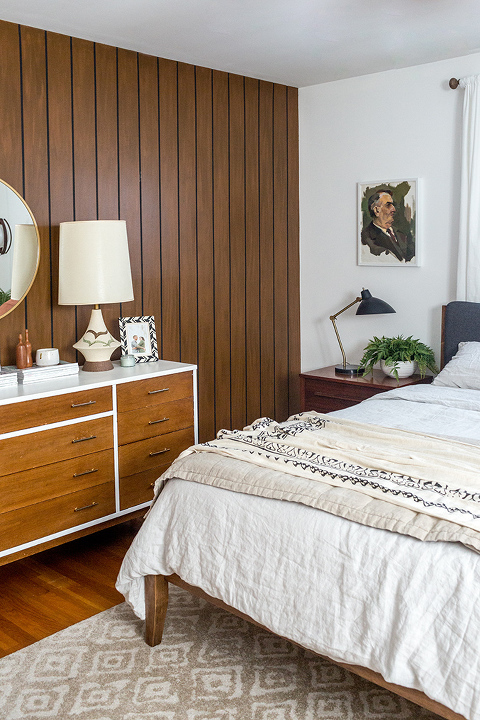 That’s wood paneling!” Point is, you, too, can easily have the look of mid-century wood paneling in your own home—no power tools required. Check back here over the course of the next few weeks as I continue making over our master bedroom with even more of our favorite varieties of KILZ® paint from Walmart, but in the meantime I want to know…Where would you add faux wood look paneling? Leave a comment describing your room below! Another great detailed tutorial. Finished wall – with its two toned paint colors – looks fantastic and realistic. I love KILZ. Worth starting every painting project with it. Paneling isn’t for me but this wall really adds to the bedroom.